The geological column is the theoretical classification system for the layers of rocks and fossils that make up the Earth's crust (also known as the standard geologic column). Fossiliferous layers can often be traced across entire continents and correlated with rocks in other countries. In such cases, these layers have been given names and assigned dates, and are frequently diagrammed as a cross-sectional column (the geologic column). Important in its development were studies on the origins of the various kinds of rocks (petrology), coupled with studies of rock layering (stratigraphy) and the fossils they contain (paleontology). The full sequence of layers was compiled following the study and correlation of rock layers on many continents, and was largely based on the interpretation that layers of sedimentary rock formed over millions and even billions of years at uniform geologic rates. Geologists have associated layers of rocks with sequence of events thought to have occurred over hundreds of millions of years. For example, it is believed that during a particular episode the land surface was raised in one part of the world to form high plateaus and mountain ranges. After the uplift of the land, the forces of erosion attacked the highlands and the eroded rock debris was transported and redeposited in the lowlands. During the same interval of time in another part of the world, the land surface subsided and was covered by the seas. With the sinking of the land surface, sediments were deposited on the ocean floor. Such recurring events as mountain building and sea encroachment and believed to be recorded in rock layers that comprise units of geologic time. Geologists have divided the Earth's history into Eras -- broad spans based on the general character of life that existed during these times -- and Periods -- shorter spans based partly on evidence of major disturbances of the Earth's crust. The geological column is not strictly limited to evolutionary thought. Creationists devised it first, before 1860. They believed more in catastrophism than in the uniformitarianism that prevails today. It is largely assumed by creation scientists that the differential fossil layers are due to the varying times of death of the organisms that died during the global flood (see fossil sorting). Evolutionists have subsequently added the so-called "periods" and "eras" in order to effectively make the geologic timeline fit within the ever-more popular theory of evolution. According to evolutionists, the Earth formed by condensing from a dust cloud along with the rest of the solar system. It supposedly grew as a result of numerous impacts early in its history and then cooled over billions of years. As such it has always been very hot in the center. About 1785, James Hutton developed an idea called uniformitarianism. In doing so Hutton unwittingly fulfilled a prediction in II Peter 3:3-6. The phrase, "All things continue as they were from the beginning of the creation" is essentially ancient Greek for uniformitarianism. Furthermore, because of this theory, men are willingly ignorant of both creation and the Flood. In other words, uniformitarianism basically assumes that catastrophic events like the global flood never happened. Therefore uniformitarianism interprets all geologic features according to processes observed in the post-flood world, while assuming that no flood took place. This principle informs everything that any evolutionary geologist has ever written. A global time scale has been derived by correlating fossils from one place to another. The Geological Column is often depicted as sequences of fossil layers known as strata, with the simplest fossils on the bottom and more complex ones on top. It is divided into several geologic periods, based on the fossils found in them. The geologic column was assembled by comparing fossils from various locations, as is illustrated in the diagram on the right. However, it is extremely rare for all of these layers be found at any one location. In reality the geologic column is nothing but a mental abstraction. The geological column is a classification system based on the fossil that are found in layer of rocks. It is assumed that certain fossils are only found in layers that are associated with a particular period of time. These fossils which are used to identify particular periods of the geological column are known as index fossils. Unfortunately, geochronologists believe that index fossils represent an absolute pattern. This concept so pervades the classification of strata that whether the geological column is based on a real global trend is difficult to determine. Information about fossils that can help check the reality of the trend, such as absolute depth, is often lacking, because in the geologic column model that information is irrelevant. The use of these fossil-defined time periods (geologic ages) is so common that it makes an independent determination of fossil distribution and back-checking the validity of the geologic column practically impossible. This gives the appearance of proof, but actually amounts to circular reasoning. Fossils do not always line up in layers. Often only one layer of fossils is found at a given site. This is particularly common with vertebrates. Sometimes they are found in multiple layers, but a statistical study of their distribution shows that even index fossils are seldom found layered on top of one another. It also shows that many fossils are artificially restricted to a few layers. Different names are given to similar fossils in different strata. This study can be found in John Woodmorappe's book Studies in Flood Geology. When looking at the fossil record through the eyes on the geologic column, one would expect to find a lesser quality of the fossil record going down. This is due to the fact that older rocks would be more likely to have been distorted then younger ones. However the consistency of cladograms with fossil taxa is nearly constant throughout the geological column. This suggest a major problem with theoretical interpretations using the geological column as it's basis. 644 million - 144 million 350 miles and 15-30 miles wide and goes from Glacier National Park to Alberta, Canada. However there is a fault line. 450 million - 130 million No physical evidence of an overthrust. 286 million - 144 million Contact is like gear meshing. Sliding would grind off lower formation's projections. Heart Mountain Wyoming, USA Paleozoic - Jurassic - Tertiary - Paleozoic supposed to be Tertiary - Jurassic - Paleozoic Fossils in the wrong order "big time"
Qilian Shan is interesting since the upper stratum is over gravel. At first glance this would seem like a perfect example of an overthrust but the implication is that all of the underlying Pliocene and Pleistocene material is gravel. An overthrust would grind the rock at the contact point, not two whole rock layers pushing one aside and going over the other. If the Pliocene and Pleistocene material was gravel to start with, both would have tended to be pushed aside. The top layer is partly broken up but that does not prove it is an overthrust. The layers seem to have been laid down together, with gravel under solid rock. In some places the Lewis Overthrust has a well defined line between the Precambrian and Cretaceous. These places lack the deformation and rubble that would result from an overthrust. Some places do have such deformation and there is a fault line which shows there is tectonic activity. It could be an overthrust, but it could still have formed where it is, the fault resulting from subsequent tectonic activity. Fossils are often found out of place according to the geologic column; many of them relate to humans. A list of over 200 anomalously occurring fossils has been compiled by John Woodmorappe. "Reworking" is used more often as an explantion since preference is given to younger fossils in dating layers. The interbedding Mississippi and Cambrian limestone near the bottom of the Grand Canyon shows they formed at the same time, erasing at least 155 million years from the geologic record. Jonathan Sarfati provides another example. Organisms such as the Coelacanth and Nautilus are called living fossils because they remain essentially unchanged from their ancestors in the fossil record. Many were thought to be extinct based on absence of fossils in upper layers of strata, but then later discovered alive and well in remote regions. This shows that a lack of fossils does not mean that an animal was not living when a given layer was laid down, which places the entire stratigraphic order and time sequence in question. Furthermore, the fact that these animals are unchanged after the alleged million years strongly suggests that the deep time never happened. Fossils do not always line up in layers; in fact in many cases only one layer of fossils is found at a given site, and this is most common with vertebrates. Where absolute depth can be considered, the pattern predicted by the geologic column does not hold. For example, there is a Jurassic site in Connecticut (Dinosaur State Park) whose fossil footprints are at a depth of 50-100 feet, and a Cambrian site in New York whose fossils are only 5 feet deep. Such discrepancies are just explained as resulting from erosion and rock movement. The most controversial findings in geology and also in archaeology are out-of-place artifacts. This term refers to human fossils in sub-quaternary or even sub-cenozoic layers, and also to clearly anachronistic artistic and even technological finds. The first such find was probably the Inca Nail, presented to the Viceroy of Peru in 1572. But the oldest alleged OOPart would be the Wonderstone Spheroids, obviously artifical constructs excavated from a very deep Precambrian stratum estimated to be 2.8 to 3 billion years old. An unconformity is a lack of geological conformity that exists when there is a gap in the expected rock strata. It describes a structural relationship between two groups of rock that are not in a normal succession, indicating that sediment deposition was not continuous. It may be formed when erosion occurs while deposition has slowed or stopped, and is generally interpreted as a time break in a depositional sequence. Ariel A. Roth wrote the following concerning unconformities (paraconformities): "The lack of evidence of time at the surface of the underlying layers of a paraconformity suggest that the long ages never occurred. "Young earth creationists see paraconformities as a serious challenge to the old earth uniformitarian geology paradigm. 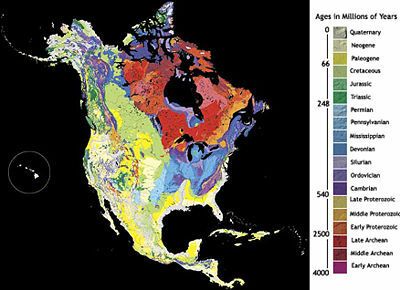 Geologic ages assigned to exposed strata in North America. While the geologic column consists of ten basic layers, all ten layers are found in very few places making up less than 1% of Earth's surface. The theory says it should be 100 miles thick, whereas, on average world wide, the sediment layers are only one mile thick. The entire geologic column was patched together from various locations. Geologists sometimes claim to have found the entire geological column at certain sites, but what they really mean is that they have found layers that they can assign to all ten geologic ages. The following list is as found at The Entire Geologic Column in North Dakota. The Ghadames Basin in Libya. The Beni Mellal Basin in Morocco. The Tunisian Basin in Tunisia. The Oman Interior Basin in Oman. The Western Desert Basin in Egypt. The Adana Basin in Turkey. The Iskenderun Basin in Turkey. The Moesian Platform in Bulgaria. The Carpathian Basin in Poland. The Baltic Basin near the territories of Estonia, Latvia and Lithuania. The Yeniseiy-Khatanga Basin in Russia. The Farah Basin in Afghanistan. The Helmand Basin in Afghanistan. The Yazd-Kerman-Tabas Basin in Iran. The Manhai-Subei Basin in China. The Qingxi Basin in China. The Tung t'in-Yuan Shui Basin in China. The Tarim Basin in China. The Szechwan Basin in China. The Yukon-Porcupine Province in Alaska. The Williston Basin in North Dakota. The Tampico Embayment in Mexico. The Bogota Basin in Colombia. The Bonaparte Basin in Australia. Of the 25 claimed locations, stratigraphic information was available on only six of them. There is little if any mention of fossils other than micro fossils such as pollen. Often the rocks seem to have been assigned their geologic age by comparing them with rocks from other locations. Most of these are hundreds of miles away and there is no direct observation of a physical connection. In some cases the "ages" are assigned to a rock layer based on the strata above or below it. These six do provide some interesting information, however. In this case, the only reference to fossils was a general reference to micro fossils. So this site seems to have little or no bearing on fossil order. Contrary to the claim that this site represents the entire geological column, the Permian period is missing. How can one claim the entire geological column is present when it is missing an entire period? The geological column labels seem to have been assigned based on the correlation with rocks from all across Libya. This means that there was sufficient room for subjective analyses, and that the labeling process assumed the geological column and thus cannot be used as evidence for its validity. The cross-section of the Ghadames Basin hints that coincidence rather than long ages brought these layers together as they are. The cross-section shows some 25 fracture lines and the pattern suggests that rather than being fault lines they are the result of compression stress. The Cretaceous, Jurassic, and Triassic seem to have been forced over the others. This seems to have occurred after they and the rock beneath them had buckled down and before both had hardened completely. Such an event could have occurred during the Flood while the layers were not yet completely solidified. While this area is rich in fossils, other than Pre-Cambrian, only Late Permian through Late Cretaceous seem to be represented and so it does not really contain the entire geological column. At least five of the formations in the area "generally lack biostratigraphically useful fossils" and were at least to some degree assigned ages based on indirect means such as the "age" assigned the strata above or below it. Thus any claim that this site is evidence for the geological column in place and in order is an example of circular reasoning. The only geologic "ages" that seem to be represented here are Jurassic and Cretaceous. Pre-Cambrian can be included since the basement rock is automatically labeled as such. The description seems to suggest that this is all that is actually found at this location. So only two out of ten geologic periods seem to be represented. Only the Mesozoic and Cenozoic eras seem to be present with no sign of the Paleozoic except for the Pre-Cambrian era (the generic label for the basement rock). In fact it seems to include only the Tertiary and Cretaceous periods, the Tertiary being Cenozoic and the Cretaceous being Mesozoic. So only two of ten geologic periods seem to be represented here. Furthermore, the nearby Qilian Shan (mountain range) Ordovician strata can be found over Pleistocene strata (part of the Tertiary). So contrary to being an intact geological column there is a place were "older" rock is found on top of "younger" rock and thus in the wrong order. 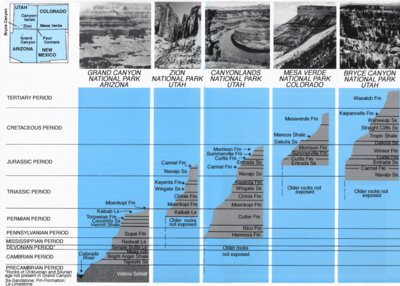 This one is fairly complete in that all "geologic periods" are present but it in no way qualifies as a complete column, since there are numerous gaps when the strata are spread out on the geologic column chart. There seems to be cases of interbedding that go between periods. They are at Devonian / Carboniferous and Triassic / Jurassic boundaries. There may be others as well. There are also cases of interbedding spanning large portions of periods that should still be separated by tens of millions of years. They occur in the Devonian, Carboniferous, Permian, Triassic, Jurassic, Cretaceous, and Tertiary. This means that the evidence suggests that this column formed a lot more rapidly than the geologic column suggests. There seems to be no reference to how any of the rock layers were assigned their respective ages but at the same time there seems to be no reference to fossils, so it is doubtful that they were used. This means that this site shows nothing about fossil order. Also known as the North Dakota Column, this is claimed to contain the entire geologic column. As stated earlier, the total theoretical column depth is 100 miles, but the depth of the Williston Basin is only 3.4 miles. This means that much of the column is missing. Such large amounts of sedimentation are possible during a year-long global Flood, because it was laid down sideways making it quite possible to lay down such large amounts of sediment very quickly, the main factors being available sediment and the rate of current flow. It does have rocks labeled as coming from all ten ages, but some interesting data can be found in The Geological Atlas of the Western Canada Sedimentary Basin.. The Williston Basin is part of the Western Canada Sedimentary Basin. Hay River Embayment (van Hees, 1964) - a depositional area northwest of the Peace-Athabasca Arch, developed on the Interior Platform, containing remnants of rocks that have been interpreted as being equivalent to Lower and Middle Cambrian units of central Alberta. The rocks have not been dated, and some of the strata may be younger than here interpreted. The embayment extends westward into the mountains of northeastern British Columbia. This indicates that when lacking fossils, geologists find rocks that they can interpret as equivalent to the rocks they are dating, in order to set a geologic age. The US Geological survey, reporting on the Williston Basin, says, "biostratigraphy based on pollen and spores has been used to determine the age of the coal beds." Other fossils include shells and fish but many layers have few if any fossils. In general these layers have not been dated by fossils. Furthermore, there is little reference to radiometric dates beyond the pre-Cambrian. The one set that is mentioned produced inconsistent results. Local lithostratigraphy and sedimentology are generally well known. However, the paucity of reliable radiometric dates and the absence of biostratigraphic control has hindered correlation within and between the assemblages and precluded accurate dating of each assemblage. There are several other cases where poor or no biostratigraphic data is mentioned, as well as no reference to radiometric dates. As a result it seems that many of these strata were assigned geologic ages based on comparing rocks. Then the comparisons were interpreted based on the geological column. The authorities seem to be assuming that because of the geologic column, the gaps must contain ages for which they have no fossils. The conclusion that they have a complete geologic column in this area is based on the assumption of the existence of the geologic column. This is circular reasoning. If that is not enough there is a place where a rock layer labeled Devonian can be found between rock layers labeled Carboniferous. Devonian is alleged to be older than Carboniferous, but this would suggest that they are really the same age. Curiously while the theoretical column thickness is 100 miles, the maximum thickness of sediment found any place is only 16 miles. That means that at any given location at least 84% of the geologic column is missing. Although it is clear there was some fossil sorting during the global flood, the Geological Column seems to be only a mental abstraction. There are sufficient assumptions made in classifying fossils and rocks to justify questioning its legitimacy. There are also sufficient anomalies to show that the timescale is wrong and that the fossil order depicted in the Geologic Column is at best a local phenomenon. In short, the Geologic Column is found only in books and web-sites and does not really exist. What is needed is a statistical study of fossil locations that does not involve the geologic column classification system, but is based only on the actual three dimensional location of fossils, latitude, longitude, and depth relative to sea level. Surface altitude above sea level should be included as well, as this would give a true picture of both local and global fossil distribution, not one based on a theoretical classification system. Geological column with explanations of each name of the geological column. ↑ Austin, Steven A. "Ten Misconceptions About the Geologic Column." Institute for Creation Research, Impact 137, November 1984. ↑ Pidwirny, Michael, PhD. Fundamentals of Physical Geography, 2nd ed. (online) University of British Columbia at Okanagan, April 16, 2008. Accessed October 15, 2008. ↑ Morris, John (2007). The Young Earth: The Real History of the Earth - Past, Present, Future. Green Forest, AR: Master Books. p. 9. ISBN 978-0-89051-498-6. ↑ Benton MJ, Wills MA, Hitchin R. 2000. Quality of the fossil record through time. Nature 403:534-537. ↑ "Out of Place Artifacts." Genesis Mission, n.d. Accessed October 15, 2008. ↑ Woodmorappe J. "Anomalously Occurring Fossils". Creation Research Society Quarterly, Volume 18, March, 1982. ↑ "Inter-Bedded Eons: Grand Canyon Layers supposed to be millions of years apart, are inter-bedded!" <http://www.bible.ca/>, n.d. Accessed October 15, 2008. ↑ Jochmans, Joseph R., PhD. "Top 10 Out-Of-Place Artifacts." Atlantis Rising, Issue 5 (Sep-Oct 1996). Now hosted by Jeff Rense. Accessed March 31, 2008. ↑ Corliss WR. Unknown Earth. Glen Arm, Maryland: The Sourcebook Project, 1980, p. 219. <http://www.cs.unc.edu/~plaisted/ce/flood.html> Accessed October 15, 2008. ↑ 13.0 13.1 Roth A. "Implications of Paraconformities." Geoscience Reports 36 (Fall 2003). Accessed October 15, 2008. ↑ Roth A. "Scientific Evidence that Affirms a Recent Creation." Faith and Science Conference, Glacier View Ranch, CO, August 2003. Accessed October 15, 2008. ↑ "Millions of Years of Gaps in the Layers." Seeking God, 2004. Accessed October 15, 2008. ↑ 16.0 16.1 Benton MJ, Bouaziz S, Buffetaut E, et al. "Dinosaurs and other fossil vertebrates from fluvial deposits in the Lower Cretaceous of southern Tunisia." Palaeogeography, Palaeoclimatology, Palaeoecology 157 (2000) 227–246. Accessed October 15, 2008. ↑ Cowgill M. "The Petroleum Geology and Exploration Potential of the Western Desert Basin, Egypt." Cairo 2002: Ancient Oil-New Energy Technical Program, 2002. Accessed October 15, 2008. ↑ Zhao W, Chen J, and Wang Z. "Qingxi Oilfield in Jiuxi Basin and Its Enlightenment for the Exploration in the Thrust Belts of Foreland Basins in Central and Western China." AAPG Annual Meeting, 2003. Accessed October 15, 2008. ↑ Kennard J. "Bonaparte Basin." Geoscience Australia, June 16, 2003. Accessed October 15, 2008. ↑ "Bonaparte Basin." Department of Industry and Resources, Government of Western Australia, March 6, 2008. Accessed October 15, 2008. ↑ Heck TJ, LeFever RD, Fischer DW, and LeFever J. "Overview of the Petroleum Geology of the North Dakota Williston Basin." North Dakota Geological Survey, March 31, 2008. Accessed October 15, 2008. ↑ Nichols, DJ. "Biostratigraphy, Williston Basin." US Geological Survey, Professional Paper 1625-A, Chapter WB, 1999. Accessed October 15, 2008. ↑ Pittman SD. "The Geologic Column." Detecting Design, August 2005. Accessed October 15, 2008. Those Remarkable Floating Rock Formations by Henry Morris, Ph.D.
Can Overthrusts Occur? Can Mountains Buckle?